Image: Surprise! Old blueprints do exist from 1929. Manningham citizens have been waiting a long time for this ghost train to arrive. Yarra citizens would also prefer to see more commuters catch public transport instead of driving polluting cars through congested streets. Truckies, cabbies, tram and bus passengers, cyclists and pedestrians would all like to see less Driver Only Driver Owned DODOs clogging up the roads and polluting the air. John Keys to the Premier Duncan Gillies 1888, quoted by Graeme Davison, The Age, April 20 2008. 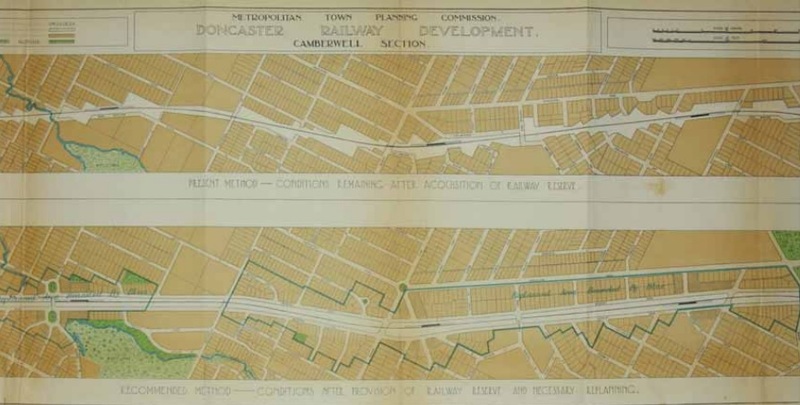 A train line from Kew station to Doncaster was surveyed in the 1929 plan for Melbourne along with the Glen Waverly line. However the Great Depression and World War II intervened and the Doncaster Line was never built. When the F19 (now Eastern Freeway) was designed in the 1970’s, a train line to Doncaster was included in the wide median strip down the middle of the freeway. when it opened the freeway only went as far as Thompson Road. The line was proposed in response to community outrage at the prospect of hundred of thousands of cars being dumped of the end of the freeway onto Alexandra Parade and Hoddle Street. Not only was the median reserved for a rail line, but a tunnel was blasted to Victoria Park station, where the train was to join the existing tracks to Jollimont. Blasting caused cracks in houses around Abbotsford, Collingwood and Clifton Hill. The rail line was published in the 1982 Melway Edition 14. This line could not be afforded by Cain/Kirner Government during a period of declining patronage of public transport and the reservations in East Doncaster where the stations were to be located were sold. outline the sorry history of this project. What is essential are separate solutions for commuters from commercial through traffic. While a tunnel is vital on a long-term basis for Melbourne’s commercial transport needs, it will do nothing to relieve the commuter congestion at Hoddle Street, and likewise a railway line would do nothing to help the cross city commercial traffic which is forced to use the freeway to nowhere. A major arterial which shrinks down to one lane going through Royal Park is scarcely a long term answer for a city whose existing cross city links are already clogged. The predominance of distribution centres and manufacturing industry in the eastern and western suburbs makes it inevitable that commercial cross city traffic flows will increase. A user pays tollway is obviously an equitable way of funding the necessary infrastructure, and it’s obvious that a railway to Doncaster is a pipedream . To minimise community disruption and protest the tunnel should run from Hoddle Street through Flemington Road without exit ramps thus eliminating the need for access roads or fly-overs in public land. The existing Hoddle St entrance and exit ramps would remain unchanged. To deal with the commuter issue for those wishing to reach the city, the obvious solution is to put a light rail/tram line along the western end of the Eastern Freeway from Bulleen Road, the line continuing on through the tunnel to Flemington Road with underground stops that would give access via escalators to the existing tram lines into the city; the No. 96 in Nicholson St, the No. 19 in Royal Parade and also the No. 55 service near the zoo. To work effectively obviously there needs to be vastly more parking provided which could be most readily achieved by constructing parking/commercial buildings at strategic points along the Eastern Freeway so that commuters would know that there is parking available which they could reach with minimal traffic delays before switching to the light rail/tram system into the city. A side benefit would be to exploit the wasted space beside the freeway. Dermot,Laverton is Melbournes commercial hub with easy high speed access to Sydney,Brisbane Adelaide and Darwin and Perth. The speed limit needs to be increased to 120 kph on all major interstate and regional routes for car and truck traffic. This can be done Today as most interstate trucks and cars easily cruise at 120kph.This would lower the accident rate as fatique is the major cause of fatalities on our roads. Coles and Woolies use the western freeway Greensbough freeway and all we need is a link from Ggeensbough to Eastern freeway. Please Dermot no more car spaces.The PTV need to provide schuttle services to main stations and bike paths for people under 65. There are a number of reasons why the recently scrapping of Melbourne Metro and its replacement with a bluff for votes scheme called the Melbourne Rail Link stinks. With the use of geodetic mapping and a basic rail engineering knowledge I was able to extrapolate a highly probable alignment if it was genuinely to be ever built. If restricted primarily to streets – for cut and cover construction and taking into account the required minimal radii for the rail alignment I’ve pin pointed the best possible / and likely location for the sub-surface Montague Stn. Various leaks more recently have indeed put its location centered on the Montague Street and the 109 LRT route in South Melbourne. Alarmingly if this line is ever actually built and of course with the construction of the East West Road Link it may impact on any proposal for a Doncaster Rail Line and potential for it to be networked as a group with the proposed decoupling of the South Morang Line which would be rerouted via Flagstaff Gardens and Southern Cross Stn to the real Fisherman’s Bend Station to be located on Plummer Street. This is only the beginning of the problem as Southern Cross Station would become a major construction site once more to provision for the proposed sub-surface platform and it would be necessary for the Burnley Loop (pl 10) and the Caulfield Loop (pl 12) to be closed during the construction phase. Effectively all trains running via the City Loop from / to the Burnley and Caulfield Loop Lines – half of the entire Melbourne rail network would have to terminate at Flinders Street for the duration of construction of this new sub surface platform at Southern Cross Stn. This could all be avoided in any future scenario for a Doncaster Hill / South Morang to Fishermans Bend Line (partially proposed by PTV) where its dedicated alignment would run from new underground platforms immediately north of and parallel to Flagstaff Stn and through new tunneling to additional sub-surface platforms at Southern Cross – beneath Wurundjeri Way. With Melbourne Metro this line of course would potentially have interchange at Parkville Station and additionally provision for a possible Doncaster Line. Sadly there has been little planning and vision from PTV to best advise the state government when consider such highly probable scenarios for the longer term development for new lines. Therefore by scrapping Melbourne Metro and replacing it with a completely different scheme there are now arguments in place by government to abandon Doncaster Rail altogether. With this situation there are now better arguments in place by campaigners to fight for Doncaster Rail and Melbourne Metro. Sean, you are right,The PTV are locked in the dinosaur age. Their concept of a Hi speed train is a train that travels at 160kph and then stops for no passengers at Ardeer,Rockbank,and Deer Park.It then enters the new Regional Rail link Bridge at North Melbourne. This bridge was designed to save passengers time by passing the third busiest peak hour station on the Geelong and Ballarat line.Due to the derailment of the XPT train in July the “Hi speed trains are restricted to 24 kph passing North Melbourne.Great PTV. I would not trust the PTV to touch my model train set. It is obvious with the Ballarat Line that the PTV members never had toy train sets. If they did they would not delay trains by one hour,half and hour ,and fifteen as they did last week end. What is surprising is that the Liberal State Government members never use public transport to and from Doncaster,and they lack the ability to think outside the square. I implore them to travel on public transport from Melton station to Doncaster Shopping town. This trip is taken with the minimum of fuss at any time outside peak weekdays. Having picked a Melton Express train and arrive at Spencer St,a tram takes you to the City centre where you catch the Doncaster bus in Lonsdale Street. These are usually nearly empty during non peak times. The bus is sometimes held up by City Traffic,This problem is easily solved by making more bus only lanes. On time we arrive at Doncaster,relaxed. To help our State Government think outside the square,here are obvious low cost ideas.Instead of building a Toll road and charging Motor Addicted drivers $20 to use a tunnel when it is built, why not charge them $10 now for using the Eastern Freeway.and into the City.London does this and have been praised for doing it.Buses are now able to move faster than when the Congestion charge was introduced. If it works in super populated London .I am confident that it would work in Little old Melbourne.